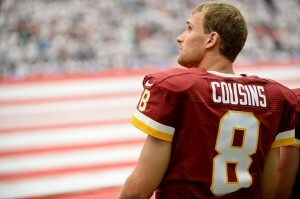 Kirk Cousins has the Washington Redskins precariously close to qualifying for the playoffs this season. It’s an idea that might have seemed preposterous early in the year, but with the problems across the NFC East, if the Redskins win next week against the Philadelphia Eagles, they’ll stake a claim to first place in the division and host a playoff game. Cousins’ play is a big reason for this. As the season has progressed, he’s gotten over several hurdles on his way to leading this team — and proving himself. It might come as a surprise to some Redskins fans, and maybe NFL fans at large, but Cousins is not only establishing himself as a starting quarterback in the league, but he’s setting several team records as he goes. Heading into Week 15 play, your Washington Redskins (6-7) are atop the NFC East division. Although they are currently tied with the Philadelphia Eagles and New York Giants, the Skins control their own destiny and have relatively favorable matchups to finish out the year. The Redskins will be at home against the 6-7 Buffalo Bills before finishing the season up with a Saturday night game against the 6-7 Eagles and 4-9 Dallas Cowboys to finish out the year on the road. Philadelphia has to contend against the Arizona Cardinals (11-2) and New York Giants (6-7) sandwiching their second matchup with the Redskins, while New York has Carolina (13-0) and Minnesota (8-5) to deal with before their regular season finale with the Eagles. Coming off of a mistake filled loss to the New England Patriots Washington Redskins head coach Jay Gruden and starting quarterback Kirk Cousins, addressed the media with their attentions now set on the New Orleans Saints. All involved know that a sixth loss this early in the season, will likely end the slimmest of hopes at a run for postseason contention. After Washington was forced to place starting center Kory Lichtensteiger on injured reserve, they decided to quickly bring in seven-year veteran center Brian de la Puente in to possibly take over for converted guard Josh LeRibeus. LeRibeus has struggled in shotgun snaps and run blocks and Gruden hopes that de la Puente’s primary background as a true center will help with that. Gruden said that the team has not “given up on Josh [LeRibeus]” but they need to see the former third-round pick improve while the Redskins evaluate “how much de la Puente can do”. It turns out that the Washington Redskins comeback victory against the Philadelphia Eagles gave everyone a sense of false hope that they would not again be the cellar dweller of the NFC East. Now after yet another collapse after halftime against the New York Jets, we are all back to reality that the Redskins are still years away from contention. Hopefully Scot McCloughan can continue to work his magic in player assessments and that rebound will be coming within the next three seasons, not a decade. Today head coach Jay Gruden, you have to start to wonder maybe how much longer, reflected on yesterday afternoon’s loss. 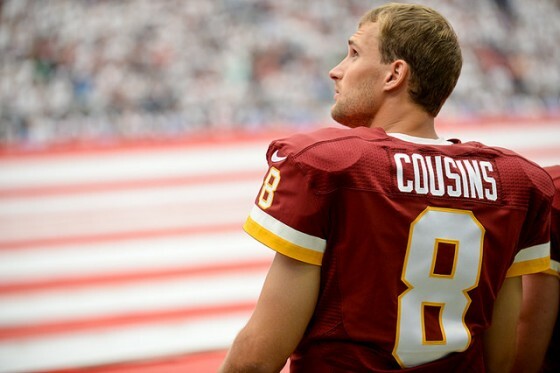 As is expected with inconsistent quarterback play, many of the questions addressed concerned the state of Kirk Cousins as the starting quarterback for the Washington Redskins. As Gruden explained yesterday, he is behind the “young” Michigan State product because “he’s getting better and he will play better”. Coach Gruden honestly believes he is “not trying to make excuses for or baby anybody”, but he has yet to find the right balance of defending his players and holding them accountable for game-changing mistakes. 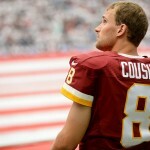 As injuries continue to mount, the Washington Redskins continue to do their best to prepare for the New York Jets. Today head coach Jay Gruden and defensive coordinator Joe Barry, an underrated addition to the coaching staff, spoke to the media. The promising news with the recent offensive line injuries to the most veteran counterparts of Trent Williams and Kory Lichtensteiger is that Gruden knows that they could play without practicing, if physically capable, because they have gotten the “mental reps” of walkthroughs. If both are unable to go, the offensive line from left to right would be Ty Nsekhe, Spencer Long, Josh LeRibeus, Brandon Scherff, and Morgan Moses who have a combined 13 starts of which only 1 (from Moses) came from before this year. Admit it. After the Washington Redskins beat the St. Louis Rams last week, you allowed yourself to get excited again. It’s okay, you’re allowed to admit it. Admission is the first step in recovery. The Redskins played well enough against the Rams, limiting mistakes, taking advantage of opportunities, and dominating on the rush. If you squinted your eyes and pretended just a bit, it almost looked like the same recipe used in D.C. for generations, from John Riggins to Gerald Riggs to Terry Allen to Stephen Davis and Clinton Portis. The big news from Jay Gruden today had nothing to do with the Washington Redskins impressive 24-10 victory over the St. Louis Rams yesterday. Instead, it had to do with the Redskins waiving former second round pick David Amerson just over two years removed from being the team’s top draft selection in 2013. Although this seems like a big deal because it is the highest drafted player the Redskins have ever released, his ineffectiveness has been clear throughout his rookie and sophomore season before finally being given the boot with the position more than stable than when he arrived. On a more pleasant note, Gruden also talked to the media about the positives of yesterday and also gave an injury update for Thursday’s game against the Giants, which is fast approaching. The big news out of Redskins Park today was that the Washington Redskins waived 2013 second round pick David Amerson in order to make a spot on the 53 man roster for defensive end Frank Kearse, who was sent down in order to make room for ILB Terrance Plummer. Amerson was due to make around $2.5 million over the course of this and next season but now will be a dead cap hit of just about $640 thousand. UPDATE: Amerson was claimed off of waivers by the Oakland Raiders just about 24 hours after he was released. It is not that Amerson cannot develop into a very good player as Gruden put it, but it was almost certainly not going to happen here. In the first of two year without having a first round selection in the NFL draft due to the trade to draft Robert Griffin III, David Amerson as a second round draft pick (51st overall) was the Redskins top pick in 2013. The 2013 draft took place during a time of excitement as the Redskins had just won their first division title since 1999 behind the rookie of the year performance from RG3. There seemed to be little pressure on the Redskins to improve through the draft during the final year of the Shanahan regime with current President Bruce Allen acting as General Manager. Just three days away from the start of the Washington Redskins regular season, head coach Jay Gruden again talked to the media following a session by new defensive coordinator Joe Barry. The team is still waiting to receive a written report from the league’s neurologist regarding Robert Griffin III‘s concussion that he sustained three weeks ago. Gruden says that he has “no idea” why it has taken this long and again wants all to know that this is in no way should reflect poorly on the Redskins as it is something out of their control. Because Griffin currently cannot participate in a regular season game due to the possibility of contact, Colt McCoy remains the backup quarterback to Kirk Cousins, however Gruden has kept the door open that Griffin could actually be the backup on Sunday if cleared.